When Maria Magdalena Oseguera woke up her son Ramiro and told him officers were asking for him at the front door of her Roy home, he didn’t want to see them. Maria told 37-year-old Ramiro he should speak to the men. Neither she nor her son knew what the initials ICE on their shirts meant. Before Immigration and Customs Enforcement came knocking at 6 a.m. on Sept. 29, 2010, the Oseguera family was the embodiment of the immigrant American dream. Ramiro Oseguera Sr. had brought his wife and five children, including Ramiro Jr., then 5, from Michoacán to the United States in 1978. In 1984, deportation cast its first shadow over the lives of the family, when the eldest son, Jesus, was picked up on a traffic violation. He agreed to self-deport, but first married his American-citizen girlfriend in a Magna Catholic church, before taking her on a honeymoon to Mazatlán. He had planned to apply for a green card from Michoacán, but while driving in their car on a narrow mountain pass, he and his wife were crushed to death by a large trailer. One week later, their coffins lay in the church where they had just been married. The family became naturalized citizens in 1987, thanks to President Ronald Reagan’s amnesty law. All, that is, but Ramiro, who, being an apathetic teen, elected to become a legal permanent resident two years later instead. “I didn’t know the consequences of not being a citizen,” he said during a jailhouse interview. Ramiro’s three sisters all graduated from college and pursued careers—one is now a corporate-training manager, another is a clinical-development analyst. 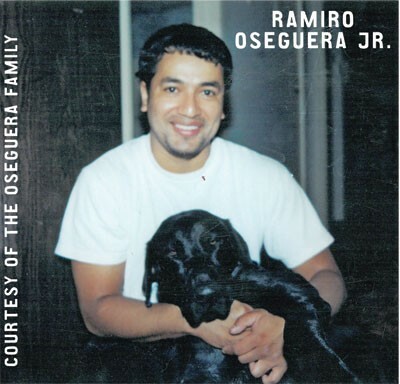 Ramiro struggled with alcohol, depression and prescription drugs, but still managed to graduate from Weber State University in 2006 with a Bachelor in Fine Arts. However, a 2002 third-degree felony conviction for theft, which he successfully got reduced in 2010 to a class A misdemeanor, not only hampered his searches for work, but, the family say, ultimately led ICE’s Enforcement and Removal Operations [ERO] agents to his door. The local consequences of the federal government’s failure to find a solution to broken immigration policies are visible in a building west of Redwood Road, guarded by a sinister black metal fence. Little wonder that when clients of outspoken immigration attorney Aaron Tarin’s finally find the imposing building, they refuse to go near it until he’s there. “It looks like a jail,” he says. No words identify what the building is or what it houses. Along with Atlanta and Omaha, it’s one of only three immigration courts nationwide that are located in commercial facilities with ICE. That collocation underscores a long-held perception among some critics that Salt Lake City’s immigration court is tantamount to a deportation assembly line. The Executive Office of Immigration Review [EOIR], based in Washington, D.C., oversees the courts. According to EOIR figures City Weekly received in response to a records request, between 2009 and 2011, Salt Lake City’s immigration judges, William L. Nixon and Dustin B. Pead, decided the fate of 8,098 people. They allowed 407 to stay, terminated 278 cases because the state couldn’t prove its allegations, and deported 7,383, the vast majority of whom were Mexican. Tarin says these figures demonstrate how brutal the odds are against the immigrant. Immigration court is an intimate universe all of its own, akin, as one West Coast immigration judge put it, to “holding death-penalty cases in traffic court.” With a choking workload of 1,173 cases pending, extraordinary dramas play out there every day. But even as a core group of 15 immigration attorneys—some of whom served Spanish-speaking missions for The Church of Jesus Christ of Latter-day Saints in South American countries—fight to keep families together, ERO agents—some also with Spanish-language missionary work in their background—work the jails and, less frequently, the streets. “We have a vested interest in keeping Utah safe,” an agent told KSL TV. Ramiro knows that firsthand. “I’m an American,” he says, “I’ve lived here since I was 5.” He and other legal permanent residents with misdemeanors or felonies in their past (three of whom agreed to tell their story to City Weekly) tend to be the only detainees who fight deportation, Ramiro says. Most unauthorized aliens, attorneys say, lack resources to hire counsel, and break under the pressures of incarceration, signing away their rights to get out from behind bars. In this court of second chances—one that is supposedly civil rather than criminal—legal counsel and constitutional rights for the jumpsuited, manacled detainees are in short supply. Some attorneys complain that ICE’s ERO agents are targeting the low-hanging fruit of aliens with minor violations, despite recent government memos to ease off the deportation throttle. Tarin argues that what occurs at 2975 Decker Lane forms part of a larger nationwide stain. He and his Nigerian-born, veteran-attorney partner, Hakeem Ishola, insist immigrants’ rights is the new civil-rights struggle. “We believe in 60 years [the time it took to end segregation in American schools], we will look back at the way immigrants and their families were rounded up and treated for civil infractions, and see this as a dark time in our history,” Tarin says.